This Friday morning we were treated to the sight of the Norfolk Southern Office Car Special. This beautiful train reflects both the Heritage of The Southern Railway and Norfolk Western. What a classy way to show your Heritage. A true sign of a first rate operation!! Come see us at the Bridgeview Bed & Breakfast There's no better view of the trains crossing the Rockville Bridge, than from our deck!!! Attention all Business Travelers!! Coming to Harrisburg, or Central PA for business?? Make the Bridgeview Bed & Breakfast your lodging choice!! Located just 10 minutes from Harrisburg, and a few minutes from Route 81 and 11/15, it's a central location for all areas. Escape the city life and relax on our river front property in peaceful Marysville, PA!! We offer clean, comfortable rooms with private baths, high speed internet and continental breakfast with your stay. There are two sitting rooms for you to enjoy, one with big picture windows overlooking the Susquehanna River, Blue Mountains and Rockville Bridge. The other with a television and couches for your relaxation!! We also have a wrap-around deck, equipped with furniture and grills for your use. Make your business travel week and relaxing one at the Bridgeview Bed & Breakfast. We also offer very competitive rates!! For reservations, call or click today!! 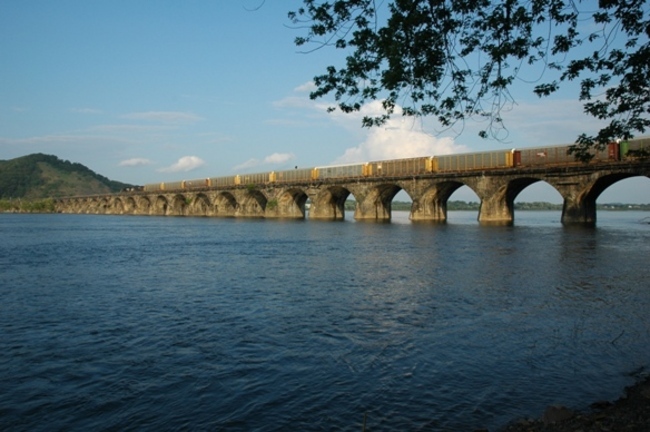 The Rockville Bridge, completed in 1902, was, and still remains, the longest stone masonry arch railroad viaduct in the world. It was constructed between 1900 and 1902 by the Pennsylvania Railroad, and celebrated it's 100th birthday this year!! It has forty-eight 70 foot spans, for a total length of 3,820 feet. 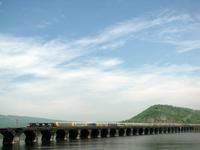 The Bridge crosses the Susquehanna River about 5 miles north of Harrisburg, PA. The eastern end is just south of Marysville, PA. The best view of the Rockville Bridge is from the deck of the Bridgeview Bed & Breakfast. It is a remarkable sight to see all the trains that use that bridge on a daily basis. For Railfans, it's amazing, because you never know what may come next. Come enjoy a piece of Pennsylvania history while staying at the Bridgeview Bed & Breakfast. We offer clean, cozy rooms with private baths. Competitive prices and week day rates make Bridgeview Bed & Breakfast an affordable "home away from home" for your next get a way!! Call or visit our website today for room by room tours, rates, and reservations. On Sunday the Steelton local featured a High Nose GP-38 & SW1500. The train was long and heavy so the two locos put on quite a show. Good to see the Steelton plant cranking out so much rail and other steel products. Come see us at the Bridgeview Bed & Breakfast There's no better view of the trains crossing the Rockville Bridge, than from our deck!! !